Here's one of BYOC's newer kits, and quite a unique pedal. 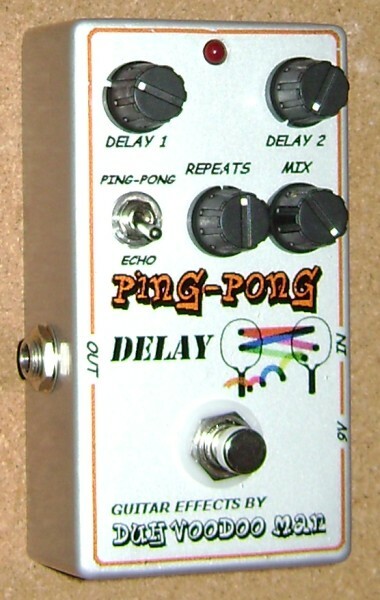 The Digital Echo & Ping-Pong contains two PT2399-driven delay stages that can be run either in series (echo mode) or in parallel (ping-pong mode). In series, the two delays are additive, giving a maximum total delay of 800 milliseconds with both delay interval controls dimed. Flip the toggle switch to the parallel mode, and the two chips function independently, giving you that cool ping-pong effect in your delay signal. Depending upon how you long you set the two delay intervals, you can generate some pretty interesting ping-pong effects. 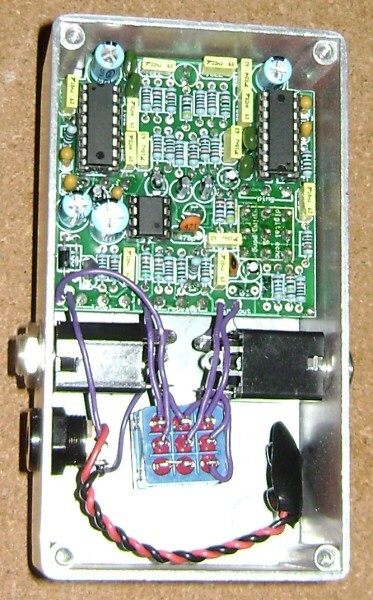 The pedal also has controls for the dry signal/delay signal mix, and for the signal repeats, i.e. setting the decay behavior of the echo signal. It's a lot of fun to play around with this pedal and see what interesting delay/ping-pong affects you can come up with. BYOC states that this is one of their most difficult builds, but you shouldn't have a problem if you just take your time and carefully follow the detailed assembly instructions. I built the delay to stock specifications and it worked fine at first test. Probably the most difficult part of the build is just how crowded the board ends up--there are a whole lot of resistors, caps and IC's on this puppy! You even have to mount a couple of resistors standing on end (the instructions are very expliicit on this), and a couple more end up mounted underneath the two dealy IC sockets! Space is at a premium, for sure! I was very pleased with how good the finished pedal sounded. Keith of BYOC comments on how warm and natural these newer digital delay pedals can sound, and he wasn't kidding. The pedal has a very pleasing tone, not dry or synthetic sounding at all. If you're looking for something a bit unusual in the way of a delay pedal, the BYOC Digital Echo & Ping Pong kit is definitely a good one to consider. Just be prepared to be doing a lot of soldering on that PCB!